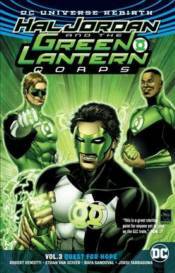 In the latest collection of the hit series, Hal Jordan and Kyle Rayner are on a quest to find Saint Walker and restore the Blue Lantern Corps while Guy Gardner deals with a personal grudge. The events lead straight into 'The Prism of Time' in which a mysterious time traveler threatens the future of the Green Lantern Corps! Collects issues #14-21.